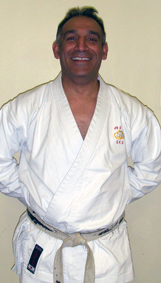 I started training in Martial Arts in 1972, in Wellingborough, Northamptonshire. Judo at school with a fellow pupil called Alan Davis. I met my first sensei Jim McCullough, a Police dog handler and Ex Marine Commando, who taught Taekwondo. The initial sessions in a church hall on York Road, with 2 other students Carl and Michael. Jim then taught at the local Army Cadets of which I attended. I continued training in Taekwondo when I moved to Gt. Yarmouth in 1977, with Chris Remy, who was associated with Billy Brennan and Mick Blackwell. I was introduced to Shukokai by a friend (Tim Reilly) and under the guidance of my then sensei Alan Martin and his wife Pat (Eastern Shukokai Karate Association) where I attained my dan grade. 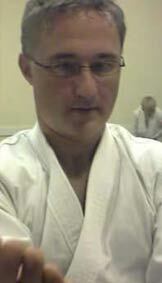 During this time I represented the AMA GB squad under sensei Barry Nash. 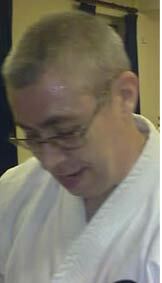 I have gained experience in various martial arts including Aikido (Frank Burlingham – Broadland Aikido) and Goshin Jujitsu (Kevin Garwood/ Mike Johnson) with whom I graded to Nidan. One of the highlights in my martial arts to date, is having trained with Chojiro Tani sensei when he visited the UK, just prior to his death and also the trip to Okinawa, April 09, to train with the masters (see gallery). An eye opening experience to see such venerable gentlemen, who in my opinion are faster, stronger and more flexible than people 70 years younger!! I started karate under the guidance of Alan Martin (Eastern Shukokai Karate Association) in late Oct 1974. I met Kantu around 6 months later after I attained my Yellow belt. Between 1988 and 2000 I served with the RAF and elected to serve locally in East Anglia so I could maintain my karate training. June 1989 I achieved a 2nd in the AMA Nationals and attained my Shodan. I was invited to train with the AMA squad by Barry Nash and went on to compete nationally and at international level. My overseas postings with the RAF kept me away from regular karate training, so I took up rugby, running and athletics. In March ’97 I represented Heian Ryu Organization (under Barry Nash) in the National Championships achieving 3rd place, after having to retire due to an unfortunate injury. I returned to the UK from Cyprus in 1999, I then joined Kantu’s club due to Alan Martin returning to his beloved Sheffield. A highlight for me was the 2010 seminar by Isamu Aragaki (10th Dan) from Okinawa who visited the UK (Dave Wilkins Dojo in Leicester) post Kantu’s visit to Okinawa. Sensei Aragaki showed the karateka that day how simple exercises can improve one’s karate by a long way! I first started Karate in 1991 at Broadland Shukokai in Norwich under the instruction of Sensei’s Mark Sutton and John Shorten. 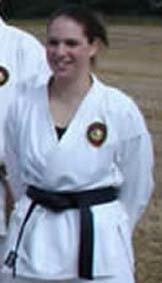 I trained for approximately a year before spending another year training in Tae Kwon do in Felixstowe. 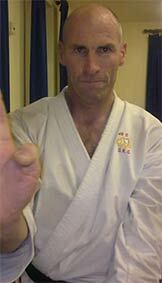 I returned to Norwich and reestablished myself with the Broadland club in 1997 and successfully attained my brown belt (3rd Kyu) in 1999. 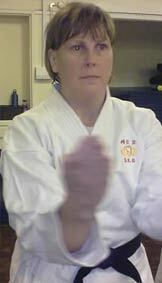 In 2000 I joined Kantu’s Gorleston club and this is where I attained my Shodan in 2007 and Nidan in 2010. I am not a natural sportsman and I put achieving my black belt down to the excellent training gained from several different instructors and just hard work. I started Shukokai Karate with ESKA in early ’97 at the Gorleston club when a friend saw an advert in the local newspaper and thought it would be a great way to get fit. Unfortunately my friend couldn’t make it at the last minute as it clashed with an evening class she had enrolled on but I decided to give it a go anyway as I needed to shed more than a few pounds!!! I attained my 8th Kyu in November ’97 and was awarded Gorleston Student of the Year that same year. In December ’01 after nearly 5 years of grueling (but enjoyable) training under the instruction of Sensei Patel, Sensei Tovell and Sensei Alison Milner (to name a few), several broken toes, ripped out toenail and weight loss of just over 2 stone I achieved my Shodan grade. I have also had the opportunity to train in other forms of martial arts during the past 14 years in my ‘angry white pyjamas’ (A must read by Robert Twigger for all martial artists).